Is it really December and time for the final Divine Design of the year? Yes, but fret not, cuz an idea this fabulous should continue through another year. Don't you think? I love the way my book is getting full of wonderful scriptures. 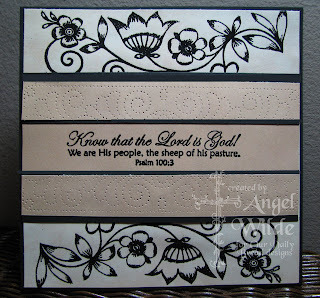 And I love the way my scripture stamp collection is growing with the ODBD stamp sets I've been blessed to own. This verse comes from "Lord is my Shepherd". I've not used the focal image on my page here, only one of the FIVE verses included. And I've used an Ornare Piercing Template (Kelley carries these at the ODBD store) allowing my design to have character without a lot of layers. 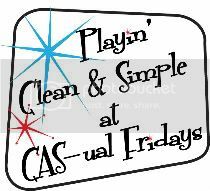 December is a busy month, so play along with us if you have time! All the details can be found HERE. This is just beautiful Angel. I'd love to see that book you've been working on-I bet its wonderful! Angel..this is simply breathtaking. The verse and piercing is so beautiful!! Beautiful card & verse! Your ornate paper piercing is gorgeous. 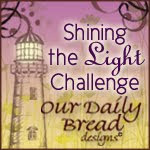 Kelley has found some wonderful scriptures to feature with the ODBD stamps, for sure :) !!! hugs to you my friend, have a gret week! This is beautiful - love the piercing! It's been an honor to be on the team with you this year Angel! Gorgeous!! I love how much detail you have with the paper and the piercing all without detracting from this wonderful verse!! I love this, Angel!!!! Great layout and love the ornare piercing on the panels. They look great!!! Great work!!!! Angel, this is beautiful!! Wow, the ornare template just takes this over the top! So pretty, Angel! I love that verse and the striking color combination you used! I love that verse, and those images and your piercing looks so beautiful!! I love this!! This is gorgeous...I love that stamp. It's so pretty on it's own..without lots of fluff or coloring. Great layout! Angel, thanks for being my friend. I am so grateful that stamping brought us together back in 2002 - and that you loved me despite that most ridiculous swap card offering EV-VAH! LOL! You are the best! I love you, friend!